The first time I had peanut butter on toast I was a freshman in college. I grew up eating things with peanut butter in them (ummm peanut butter cups anyone?) but I had never eaten peanut butter alone. My parents did not move to the states until after they were married, and both in Italy and Jordan peanut butter is not used. So I had never really had peanut butter on toast. When my friends were eating pb & j sandwiches, I was eating Nutella on arabic bread. 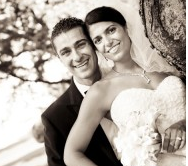 At the time no one knew what Nutella was, and I tried to keep my dirty secret to myself. When word got out, my friends were both jealous and horrified. Chocolate hazelnut spread??? Yes, I was lucky, but I was also considered weird. In college I started eating peanut butter on toast, sometimes with jelly and sometimes with banana. Now I eat peanut butter almost every single day, and I can’t imagine my life without it. Still, I can’t believe I had never had a proper PB & J. Finally, the other day I took two pieces of delicious whole wheat bread, slathered one side with peanut butter and the other side with jam, and made my first PB & J.
I didn’t want it to end. I only ate one half of it at first, but it was so good I went back and ate the other half. What kind of jam? On one side I had low sugar raspberry preserves, but on the other side I had homemade cranberry jam that Chelsea sent me in the fall (recipe here). It is sweet and tart at the same time, and makes for a great PB & J sandwich. I am so excited to bring the PB & J into my life! What foods did you not try until you were older? I would say peanut butter and avocado are two of my strangest, since I love them so much now! I never had a peanut butter sandwich until law school. We just didn’t eat peanut butter sandwiches when I was little. We always had deli meat. hahah that is so funny! there is honestly nothing better than a good pb&j on soft whole wheat bread! happy you’ve joined the club, girl! I grew up on PB&J or PB&B (peanut butter and banana). But the jelly my mom got me hooked on as a kid – apple jelly. Makes me miss home. But I’d say the most recent thing I’ve tried and LOVED would be brussel sprouts. I had them for the first time a year and half ago (or so) and I am obsessed with them!!! I remember being in college, and my roommate having Nutella – no one even knew what it was then. So good! Pb and jam on toast is my favorite way! Mmm… Nutella! I didn’t have that until I was in my 20s! So I’m jealous that you grew up with it, lol. LOVEEEE peanut butter. And it made me want PB and Banana with a little honey on whole wheat bread, badly when i read this :)- but i thought I’d make a personal peanut butter suggestion… (if you haven’t already discovered it)… The Whole Foods Honey Roasted Peanut Butter (that you crush yourself) has the be the BESTTTTTTT peanut butter EVER! I mix a little of the almond butter in it too, so it’s not as sweet 🙂 You should definitely try it!! @Laura, When I lived in Rhode Island that is all I ate!!!! Our Whole Foods here doesn’t have it though- they only have the super plain one yuck! So now I am addicted to the Skippy Natural. It is horrible I know, but I am addicted and can’t stop! Alfredo sauce! I always stayed away from it because I knew how unhealthy it was. Now, I like it but I rarely have it. Hmm what else? Probably Mexican food. We rarely had it as kids (actually probably not until we were in our teen years), but I make it and eat it often now! @Tricia Kuchler, Same here! We NEVER had Mexican food growing up! How could people not know what Nutella is in Rhode Island?!? That’s insane! It’s an Italian staple, isn’t it? Since you’re a fellow New Englander, have you ever tried peanut butter and fluff? It’s, by far, the most amazing thing. I’m talking real fluff, not “marshmallow creme”! As far as foods I was introduced to as an adult: brown rice (we were a potato family), cauliflower and brussel sprouts, all of which I love now! @Lindsay @ The Ketchup Diaries, I have never had fluff before… except in a Rice Krispies treat! Don’t judge!!! Yum! I still love PB&J. There’s a reason it’s a classic. 😉 There are some random things I’ve never eaten but it’s mostly a collection of restaurants. People can never believe that I’ve honestly never visited Taco Bell or KFC. I’m a Rhode Island girl-still here 🙂 I was just going to say that people have never had fluff- which I find crazy!!! I have always hated Jelly so I always had a pb+fluff smammich… or nutella, fluff and pb… you NEED to try it.. I no longer eat fluff because it has egg whites and I’m vegan, which is so sad!!! As far as foods that I had for the first time in adult life.. quinoa, indian food, tofu.. mmmm all good stuff! I eat a teaspoon of PB every day on an whole wheat english muffin everyday for breakfast. We grew up on PB in my house. My friends thought my sister and I were weird when they found out we put pb on our french toast…yummy! We were never really big on PB at my house, I am not either. I mean I like it we just never eat it too much. mmm pb. So amazing. I eat it almost every day as well. I have never tried brussel sprouts until I met Josh (my mom does not like them) and now I’m a HUGE fan! I am lucky in this category. There was nothing I would not try as a kid and growing into an adult. I guess if I had to name something it would be tacos. We never had them growing up and the ones in the college caf were not appetizing looking. After college, I guess I had Taco Bell but I never made tacos or fajitas or anything. Now I can live without them. you are seriously the cutest person ever, and i LOVE how the fact that you never tried PB&J speaks of your heritage! it’s actually pretty cool 🙂 but i AM glad that you’ve tried it now – it’s definitely a staple in my diet! 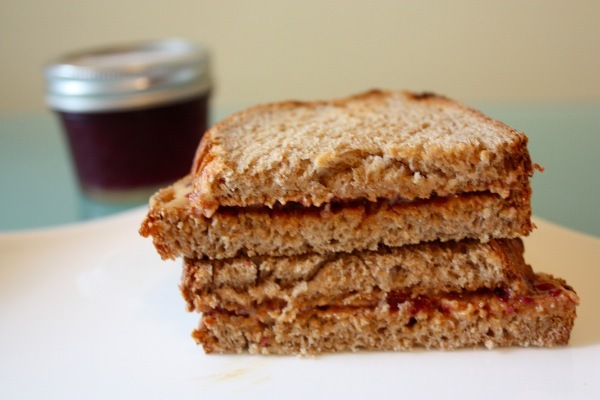 PB&J is seriously the best combo – I had one every day for lunch throughout grade school. Try strawberry jelly – it’s my favorite combo! I never had lox until in high school. Does that count? I guess it’s kind of a weird food but now I love it – on a bagel, with cream cheese, capers, lettuce, tomato and onion – yum! And still have never tried Fluff though I’ve been offered many times. Sorry – it looks disgusting to me! A mouth full of marshmallow? No thanks. I thought they were ALL gross and would never ever try it/them. Now I have all of the above several times a week. EVERY week. Oh man, the hubby LOVES a good PB&J.. it’s his lunch everyday. Kid you not! I never had sushi until I was in college – now it’s a staple! Dried olives from Tony’s in RI! You have not explored the full realms of Peanut butter until you explore it with homemade toasted fresh bread.A breakfast staple in our home for many years of bread-making (many varieties) until my waist cried (boo hoo) a halt. Hi, I’m a new reader, great blog! To this day I have never had a PB&J and pb is daily for me as well. I like PB&nutella (I have Italian roots too) or PB&Banana. sometimes I put nutella and melted pb on a frozen banana as a special treat!